Winter view after drainage and landscape design was installed. Cindy and Chris were house shopping in Eastmoreland Portland, Oregon. Chris found the house and brought Cindy to take a look. The curb appeal was so bad she gave it the thumbs down and would not even go in the house. After looking at several other houses which just didn’t work for them, her husband talked her into going back. She went inside and fell in love with everything but the front yard. There was one big problem which wasn’t apparent at the time of purchase and might not have been bothersome if the house was in Arizona. Water!!! Water in the basement, and large puddles of winter rain water in the front yard drowned plants and lawn alike. As the years passed the problem worsened. I’m married to a designer/remodeler and while he is a creative and competent professional, he can get a little pale talking about the complexities of finding a water leak. It can be very tricky even when you have solved these types of problem in many different situations for years. Its nothing one should ever be arrogant about. Rain garden clears away winter water from entry patio in Wilsonville. I used Dwarf Red Twig Dogwood in this design as well as Cindy’s. Cindy is a figure it out, research the heck out of it kind of person. She talked to lots of different contractors, asked great questions and decided that a rain garden was going to be part of the solution for the water problems in her home. She took classes from the City of Portland and researched rain gardens. She determined the volume of water her roof and downspouts needed to handle using the formulas she learned in the class. Her solution was to install larger gutters and downspouts and have a dry well dug and installed to handle the overflow. Cindy was not prepared to take on the front yard alone. She decided to hire a landscape designer she could collaborate with. I am not licensed to design drainage solutions. Cindy knew that. I was hired to create a landscape plan with her that would create beauty and curb appeal and hide all views of the mechanical water solutions. I design for beauty of the landscape and to enhance the appearance and the welcoming energy of the home. I don’t like seeing irrigation valve boxes, irrigation heads and tubing, or drainage hardware. It’s ugly. It would create a second level which helps to add drama and contrast to the otherwise flat yard. We used the excess soil we would dig up to do the dry well. It’s a terrible thing to waste good top soil so we didn’t!! 3. They wanted a Japanese Maple. 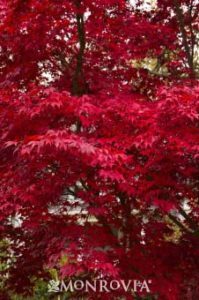 Cindy and Chris loved the up right (not the weeping form) of dark purple leafed ‘Bloodgood’ Japanese Maple. Japanese Maples, Acer Palmatum, are much healthier here in the Pacific Northwest when they are planted up on a berm. The raised soil keeps their roots from getting soaked in our winter rains. Dryer roots helps to avoid the dreaded verticillium wilt which kills so many of our beautiful maples here. Plantings on the berm under the Japanese Maple would be highlighted because they are on a higher grade in the lawn. We tucked a few boulders in the berm. 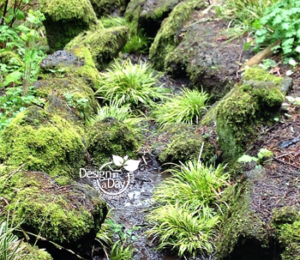 We added multi sized river rock over the top of the dry well and made it look like an attractive dry stream bed that fit into the berm nicely and as per Cindy’s plan would direct water to the dry well. Cindy loves the Inkberry shrub. It’s great for wet areas. We still had a wet area near the dry well that needed plants. Cindy loved the evergreen Inkberry and Kelsey’s Dwarf Red-Twig, Cornus Sericea ‘Kelseyi’ shrubs I used. She had never seen the Inkberry, Ilex Glabra ‘Shamrock’ before. It’s the only evergreen shrub I use for low wet areas. 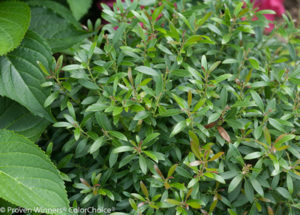 Other typical small evergreen shrubs like Azaleas and Pieris get root rot and cannot be used in wet area applications. We selected classic foundation plants to frame the house, added a large pot and Strawberry Tree, Arbutus Unedo ‘Compacta’ to pick up a little Italian style on the south side and we were finished! I talked with Cindy recently. “The front yard is thriving. I’m so happy every time I look at it.” The design has stood the test of time. It’s been 10 years since we installed the design. The only thing she changed was replacing her Johnny Jump Ups Violas for Black Mondo Grass. Mission accomplished, she loves her front yard! Cindy and I created the design together in a day. It was a simple design meant to be low maintenance with full season interest. Her landscape contractors installed the design, I came by and placed the plant material for the contractors and it was done. Voila! As a Portland landscape designer I like my rain garden designs to have year round color. Many Portlanders have rain gardens in the front yard so it’s important to have year round color. Without careful plant selection rain garden plantings can look forlorn in the winter months with no leaves or color present. I love a good hit of color to offset our typically gray winter season. To select plants for a rain garden I start by thinking about the areas of a rain garden that have different degrees of wetness. There are fewer evergreen plants that work well in the wettest areas and a wider range of plants for the sides and the top which are less wet. Knowing which plants will thrive in this situation ensures I select the right plant for the right place. Plantings used: Miniature Golden Sweet Flag is a 4″ tall chartreuse evergreen blade. Use the Latin name, Acorus gramineus ‘Minimus Pusillus Aurea’, to get the right plant. The evergreen narrow gold tufts form a somewhat flattened pinwheel which adds interesting texture. It will take standing water that drains away so it’s perfect for the wettest areas of a rain garden. If the area is a lake for a week at a time, that is too wet. Miniature Sweet Flag is unique because it also thrives in dryer sunny areas. I don’t use it in heavy shade designs. False Bugbane – Beesia deltophylla has glossy evergreen heart shaped leaves. It’s a perfect companion plant for the narrow blades of the Miniature Gold Sweet Flag; together they make a perfect year round color combination. The Beesia would die planted in the lowest wettest area so I plant it above the Golden Sweet Flag in a rain garden. 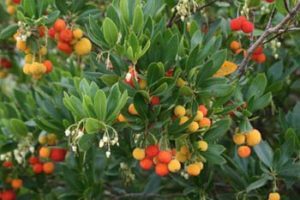 Designers know Compact Inkberry Holly – Ilex Glabra ‘Compacta’, will survive temporary standing water but there are few if any other choices for the Pacific Northwest. I’ve used Compact Inkberry Holly, on the sides of a rain garden. It works as a house foundation planting too. Don’t be fooled by the word “compacta”. It will happily grow to 4′ tall. Fortunately you can prune this shrub once or twice a year and keep it 2’ by 2’. 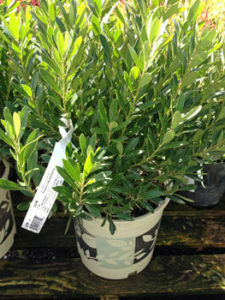 Not convinced about wet soil and evergreen shrubs? I will restrain myself to listing just 5 evergreen that die a sad little death in overly wet winter soil: Azaleas, Escollonia, Pieris, Rhododendron, and a variety of conifers to include expensive little dwarf Hemlocks. Ouch! New rain garden design gets rid of the winter lake in this entry courtyard. My client built it herself. A winter lake flooded this small entry courtyard every year for weeks at a time. 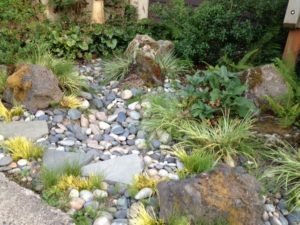 My client installed her own rock and plantings from my design but had the pipe that carried away the water installed by professionals. After the rain garden was installed we added two vine maple on either side. The vine maple trees on either side of the rain garden would be dead instead of showing their glorious fall color. Vine maple hate poor drainage and prove it by promptly dying. Dwarf 16″ tall red twig dogwood “shrublets” Cornus Sericea ‘Kelseyi’ and a 12″ tall Golden Sweet Flag called Acorus gramineus ‘Aurea’ adds interest and year round color. Lots of people love red twig dogwood. It’s a great plant for year round color and its important to get the right plant! Some varieties of dwarf red twig dogwood get 6′ tall. Other red twig dogwood can get 15′ tall. Cornus sericea ‘Kelseyi’ is 12″ to 18″ tall. This dwarf dogwood variety has short colorful red twigs in winter but can get unattractive fungal leaf spots in spring. I don’t know of a dwarf variety of red twig dogwood that is free from spring fungal leaf spots. It’s a very useful plant. Life is too short for spraying plants with chemicals and really dear reader, who has time to intelligently apply fungicides? 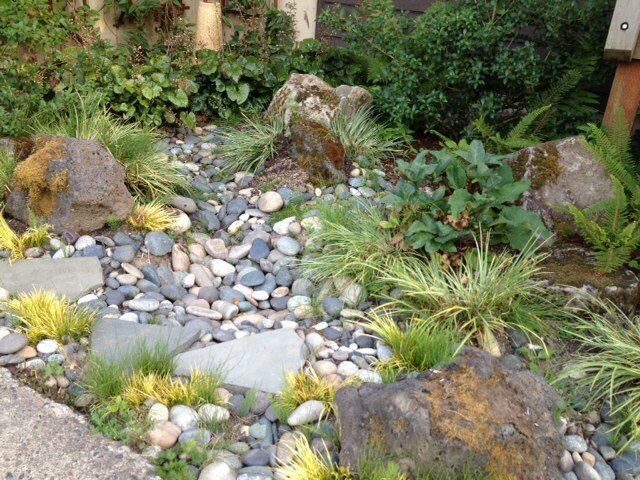 Hillside garden with dry stream bed in NW Portland. This hillside garden was designed to be seen from the master bedroom. There is a lot of water that moves through this hillside so it has a dry stream bed to collect the water with a drain at the bottom. It doesn’t have any plants inside the winter water area so I don’t consider it a true rain garden. The plants were installed behind a low retaining wall which is hidden by the plants foliage which spills over the walls. These clients are gardeners so I use a wider variety of plantings for their design than I would for non gardeners. Ferns carry the garden for 9 months of the year. Evergreens such as native Oregon Oxalis – Oxalis organa, Japanese Soloman’s Seal Polygonatum Falcatum (evergreen Soloman’s Seal), Hardy Geranium – Geranium Macrorrhizum and Carex grass provide year round color. Toad Lilly – Tricyrtis hirta, provides exotic color in the fall. Out of all these plantings only the Carex grass can handle excessively wet winter soil. Landscape Designer Barb Hilty designed this rain garden using no plants at all. The full season interest relies on the ornamental rain chain, the shape of the steel boxes and the black rock to carry the day year round and allow this home owner to disconnect the downspouts in style. Vicki Masterson wanted her dream garden. She and her husband Pete were recently retired. She had a beautiful new home and was looking forward to having a yard to play gardener in for the first time in her life. She expressed her deep concerns about the landscape’s ability to ever play its part in her dream. She and Pete had never worked with a landscape and yet accurately diagnosed severe drainage problems and an extremely high water table on their site. Her neighbors told her that in winter, “everything is pretty much a lake“. Their soil was sludge and the view from the great room was a 10′ high wall consisting of straight stacked ugly boulders, topped with a 6′ wood fence. Pete and Vicki selected Carol Lindsay of Landscape Design In A Day to help them with their difficult backyard. Amending the soil and hiding this ugly wall with plants was not possible due to the high winter water table. On our design day it was still summer – so instead of water logged muck – we had impossibly hard baked clay. I was glad to know that I could solve it all and give Vicki her dream. The first thing I did was meet with Donna Burdick of D&J Landscape Contracting. Over coffee we poured over photos and discussed the site’s problems. Notice all the raised beds? The drainage is in the paths and will take the winter rain water off the property. Donna designed a professional drainage plan. With this kind of collaboration, the designer’s vision leads the process and the clients dreams are realized. The drainage solution disappears into the design. Good drainage opened the plant palette so I could pick from thousands of possible plants and combinations for Vicki and Peter Matterson. Deciduous shrubs such as Cornus sanguinea ‘Midwinter Fire’ provide stunning winter interest with its rich orange, red and yellow stems. I created an area for wetland plants with varieties that will be perfectly happy with the high water table and tall enough to visually soften the wall. D&J Landscape Contracting created easy access to the backyard from the adjacent wetlands, saving the clients money. Her neighbors told her that in winter:”Everything is pretty much a lake.” Their soil was sludge. This photo shows the view from the great room – a 10′ high wall consisting of straight stacked boulders, topped with a 6′ plain, wooden fence. My clients had disconnected their down spout and sort of had a rain garden but rain water flowed across the front walk making it slippery, mossy and messy. D & J Landscape Contractors. We worked together to finalize the design and then placed the rock to create the stream effect. Plantings were the finishing touch. Hellebores and ferns went outside the rain garden, in the dryer soil areas. Before Rain Garden: The Smiths enjoy their holiday flamingos in a wet untamed area by their front door. The plantings look good even at Christmas with glossy gold grass and dark green leafed plantings. Now when the Smith’s get out their flamingos for holiday decoration, their entry looks lush and welcoming. The client and Carol Lindsay of Landscape Design in a Day placed the rocks and plantings. No more standing water. The rain garden fits into my clients’ garden style beautifully. Small courtyard entries are the norm in Charbonneau, a planned community in Wilsonville, Oregon. My clients had a yearly winter pond in their courtyard entry. The soil has heavy clay and does not drain well. My clients in this area do a lot of soil prep. They have to install drains or take drastic measures to deal with winter rain water. One half of the courtyard was buried in several inches of water every time it rained. It would take days or even weeks to drain away. We decided a rain garden with pizzazz might solve their water problems and fit in with their garden style. The client and Carol Lindsay of Landscape Design in a Day placed rocks and plantings. We used the large-sized Gold Acorus grass (Acorus gramineus ‘Ogon’) with Kelsey’s Dwarf Red-Osier Dogwood (Cornus sericea ‘Kelseyi’) along the back wall. We may look at using a dwarf Compact Inkberry Holly (Ilex glabra ‘Compacta’) instead as the garden continues to develop. The client installed their own perforated pipe under the rain garden – resulting in no more standing water going for over five years now.